It may no longer be the International Year of Pulses, but lentils, beans and peas have been a staple for me ever since I can remember. They are not only nutritious, delicious and filling, but they make a great base for many a meal. 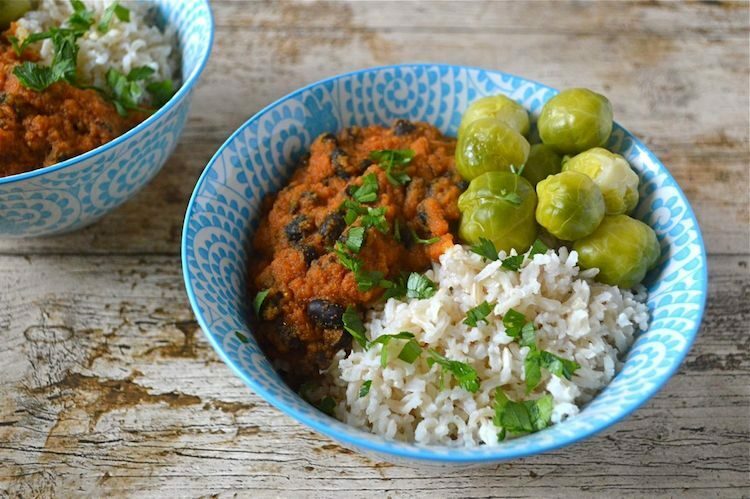 These black bean tomato carrot curry bowls are simple to make and they taste very good indeed, especially when served with brown basmati rice. A perfect healthy whole food supper for Veganuary and to Jumpstart January. The recipe is adapted from Meera Sodha’s new vegetarian cookbook, Fresh India which I featured in my Christmas gift guide. It’s fast become one of my favourite books. Meera’s curry, which she names Rajma contains kidney beans and no carrots. I had no kidney beans to hand, but I did have some cooked black beans in the freezer; I thought they might look rather dramatic against the red of the tomato sauce. My veg rack was sporting a few not-quite-but-nearly wrinkled carrots, so I thought I’d better use them up quick and incorporate into the sauce. I substituted a red chilli rather than a green one, omitted the chilli powder and used slightly different quantities of the other spices. The sauce for the black bean tomato carrot curry is whizzed up in a blender. I used my Optimum G2.3 platinum series induction blender, This made short work of grinding the onions, carrots, ginger and other firm ingredients into a loose paste. It was then a simple process of frying some spices, adding the sauce and finally the beans and a few more spices. I served the curry with the last of the Christmas Brussels sprouts and brown basmati rice. This is probably my favourite rice: it’s fragrant, slightly nutty and keeps the selenium, manganese, niacin, calcium, magnesium, fibre and more that is largely lost in white rice. I like a bit of chilli heat, but you can always use a mild or small chilli instead if you don’t want it too hot. We ate half of the curry one day and the remainder the next. Like all curries, it was even better on day two. A simple, yet delicious curry with hidden carrots for fussy eaters. Wash the rice well, place in a pan with 425ml water. Place a lid on the pan. Bring to the boil, then turn the heat right down and allow the rice to steam for 30 minutes. Turn the heat off and leave the pan covered for a further ten minutes or until ready to serve. Blitz the onions, carrots, chilli, garlic, ginger and tomatoes in a blender until a loose paste forms (I use my Froothie Optimum G2.3). Heat the oil in a large pan and fry the cumin seeds for a few seconds, then add the tomato paste. Stir, bring to a simmer and cook for twenty minutes. Fill the empty tomato tin with water and add this to the paste. Bring to a simmer and add the beans and remaining spices. Add salt to taste and cook for a further ten minutes. Scatter the coriander leaves over the top just before serving. Serve with the rice, your choice of green vegetable and pickles. Soak the rice in warm water for at least an hour before needed to speed up the cooking time. Wash well and cook as above. For even more curry inspiration, head over to my Cure All Curries board on Pinterest. There you’ll find plenty of both vegan and vegetarian curries from all over the world. I’m sending my black bean tomato carrot curry to Jac at Tinned Tomatoes for Meat Free Mondays. It also goes to Elizabeth’s Kitchen Diary for the No Food Waste Challenge – those carrots really wouldn’t have lasted any longer nor would the Brussels sprouts. As a Froothie Ambassador, I can offer Tin and Thyme readers free P&P on any Froothie blender – add 2483 free ambassador delivery to the comment box when ordering to get free postage and packing. Delivery will be credited back onto your card. The Optimum G2.3 is currently on offer at £399. For more recipes using Froothie blenders take a look at my Full on Froothie page. I’m sharing this black bean tomato carrot curry bowl recipe with Everyday Healthy Recipes for #CookBlogShare and with Searching for Spice for #CookOnceEatTwice. Like this recipe for Black Bean Tomato Carrot Curry Bowls? Pin it for later. I use my Optimum Blenders for smoothies, spreads, sauces and even chocolate making. The post contains affiliate links. Buying through a link will not cost you any more, but I will get a small commission. This helps keep Tin and Thyme blythe and blogging. Opinions are, as always, my own. Yum! I can never follow a recipe to the letter, even one from a really great cookbook, so I like the sound of your substitutions! thanks for sharing your wonderful recipes. I have been a vegetarian for 5 years now and I can’t tell you enough how your blog has perked up my cooking! I look forward to your postings and trying your recipes. Thanks again and best wishes for the new year. Hello Joe. Thank you so much for commenting and letting me know. That’s possibly the nicest thing that’s happened to me this year 🙂 Happy New Year to you too. I love that black bean tomato curry sauce! It’s not only healthy, also very delicious, Choclette. Black beans are my absolute favourite, I bung them in everything! This looks like perfect January food and I am totally craving sprouts again now! Black beans are so good. I’ve only come across them in the last few years. My mother always used to use large black beans which I wasn’t very keen on, so I was suspicious of these turtle beans – until I tried them! There is something about brown rice – plain or basmati that just screams healthy and goodness! this looks like it would be really satisfying. I would be so lost without a good blender. I use it most days. This is such a lovely vegetarian recipe, Choclette. I simply love the smell of Basmati rice. And the black beans there is a perfect match. Oh yes, so right. The scent of basmati rice cooking is wonderful. Thank you. I have made the Rajma curry from Meera’s recipe and substituting Rajma for black beans sounds perfect. I have only just started using black beans and find them so easy to cook. I’d be interested to hear what you think of Meera’s book Mina? Black beans are just fabulous. This curry sounds perfect for a weeknight meal! It really is Kat and it’s also really easy to bulk up if needing to feed a crowd. This looks like a perfect meal! I think I may have found me new favorite curry combo! You rock at these bowls Choclette! 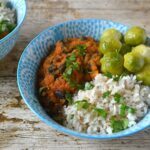 Thanks for entering them into Meat Free Mondays, I featured your recipe and the roundup is now live, if you would like to see what else was featured this week or just how bonnie your dish looks. Right, now time to do a bit of promotion for this post for you! Love this and such a tasty combination with the black beans and carrots, and i’m a big fan of brown rice too. Thank you. Brown rice has such a lovely nutty flavour, I’m not quite sure why it is generally despised.